The toll going into Monday was six presumed dead. But on Monday the Colorado Office of Emergency Management said a body recovered from El Paso County raised the total to seven. The body was found by Colorado Springs authorities about noon Monday in the West Fork of Sand Creek on the east side of 4600 Town Center Drive, said Barbara Miller, spokeswoman for Colorado Springs police. She did not release any more details except to say foul play was not suspected. 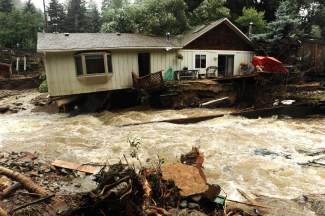 Hours later, Idaho Springs police said an eighth victim had been claimed by the floods. An 83-year-old man was killed Monday afternoon when the ground collapsed beneath him and he was swept away by Clear Creek, Idaho Springs police spokesman Jim Vogt said. The man’s body was recovered 3 miles downstream. The man is considered a victim of the flood because the water level of Clear Creek is well above normal, Vogt said.The grim statistics: three dead in Boulder County, two in El Paso County, one in Clear Creek County and two missing and presumed dead in Larimer County.